King’s Quest (2015) is a nostalgic video game that was released in chapters over a span of almost two years. As a note, I separate the 1984 version from the 2015 version since they share the same name. In May of 1984, Roberta Williams created a game that spawned a multitude of sequels. For me, I remember spending countless of hours at my friend Joshua’s computer trying to figure out the next puzzle. It hooked me on video games for life. As a result, King’s Quest was my gateway drug. The original Kings Quest Series (1984 onwards) was known for its bad puns and exotic ways to die (with commentary that seems to break the fourth wall regarding said death). Auto save did not exist and you learned to press F5 (save) often. Forgetting to save meant retracing an evening’s work. You walk around your kingdom, collecting items and using them in exotic ways to solve puzzles. The first few entries in the series required you to type in commends (get berries, put hand in hole, get dagger). Verbs are key in these early entries (although ‘get’ had way too much use). The series evolved from using arrow keys. Eventually, it set the standard for puzzle games by introducing the mouse and icons to click on objects. It never got old using the tongue and hand cursor on everything. Apparently the solution did not involve you tasting yourself. 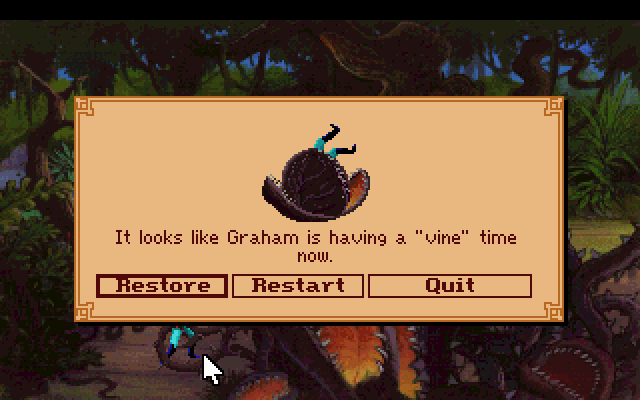 Part of the fun in the early games was dying in horrible and very unique ways (so long as you remembered to save frequently). The King’s Quest (2015) chapter games were about as long as the original games. I finished the first chapter in about a week. What was intriguing about the chapter games was that they filled in the times before and between each of the original games. The first chapter is a prequel to the King’s Quest (1984) game and each chapter is between each subsequent game. Every plot point in the chapters brought back sprinkles of nostalgia from when I was a kid. 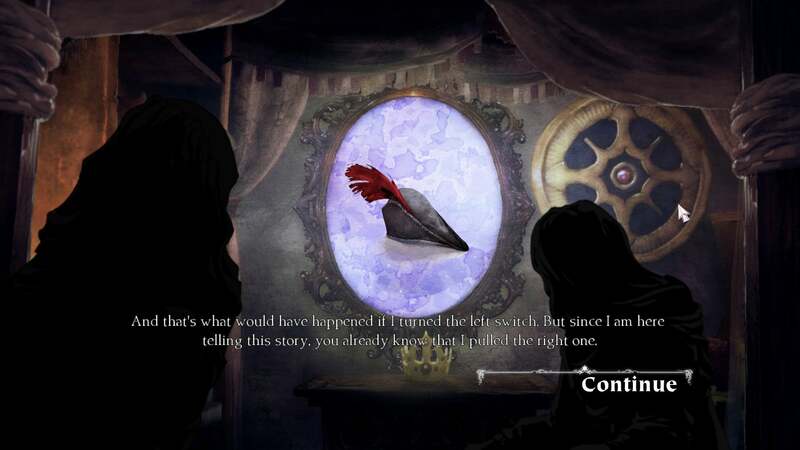 Both fans of the original and newcomers take something different but meaningful from King’s Quest (2015). Without giving away spoilers and plot points, there are moments of true laugh out loud hilarity. In particular, the developers spent the money to get two amazing voice actors. Our first actor is Wallace Shawn. Shawn played Vizzini from Princess Bride, Rex from Toy Story, and dozens more. He seems to pop up in just about anything that needs a Shawn Wallace voice or character. What is fabulous is when the developers destroy the fourth wall and reference a couple of his prior movies as an inside joke. 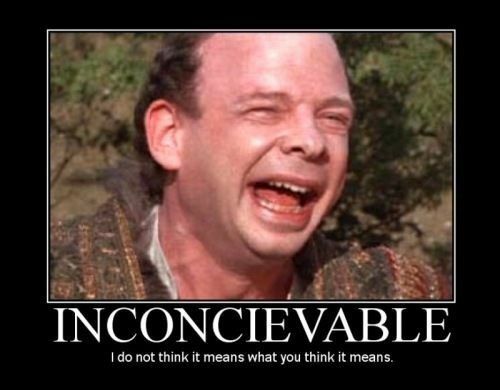 (Hint, a Princess Bride Reference). To compliment Wallace, Christopher Lloyd plays the narrator and the older voice of the protagonist. Acting credits for Lloyd include: Back to the Future, Judge Doom from Who Framed Roger Rabbit, Uncle Fester from Adams Family, Kruge from Star Trek III, Professor Plum from Clue, and way too many more for me to mention. At one point, I had to immediately replay the first chapter just to make sure that I heard what was said properly because I was laughing too hard. (Hint, Back to the Future Reference). 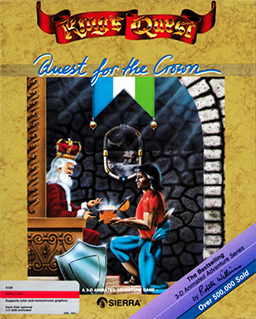 While other “Quest” series spawned around King’s Quest (Space Quest, Police Quest, Quest for Glory, Leisure Suit Larry, and many others), I will always look back fondly on my first foray into this niche market. Playing King’s Quest (2015) these last two years has made me feel like a kid again.